The success or failure of Russia’s transformation into a stable market democracy will determine the degree of international stability throughout central Eurasia (former USSR) and Eurasia writ large (the ‘World island’ stretching from China to Europe east to west and from Russia to India and the Persian Gulf/Middle East from north to south. For a large multinational state such as Russia and for smaller ones elsewhere in the noted region, successful political and economic development depends on building an efficient democratic federal system. Indeed, one of the main institutional factors leading to the demise of the Soviet partocratic regime and state was the considerably non-institutionalized status of the RSFSR (Russian republic) in the Soviet Union’s pseudo-federal national-territorial administrative structure. Only such a system can hold together and effectively manage Russia’s vast territory, the awkward administrative structure inherited from the failed USSR, and hundreds of divergent ethnic, linguistic, and religious interests. Dissolution or even any further weakening of Russia’s federal state could have gravely dire consequences for Russian national and international security by weakening control over its means of mass destruction. Russia’s challenge is historically unprecedented. No state of Russia’s size and complexity has ever needed to develop national identity, democratize, marketize, and state-build simultaneously. Moreover, no empire has ever reformed itself into a federal democracy. The Ottoman, Austro-Hungarian, Imperial Russian, and Soviet cases are a few of the failures. The Soviet collapse can be considered the first stage of Russia’s effort to transform the legacy of empire and unitary rule into a functioning federal state. Its failure might be a harbinger of things to come. Russia, like the USSR, is a uniquely diverse and unwieldy entity territorially, ethnically and religiously. Its square mileage and border lengths dwarf those of other states, and its multitude of nationalities is rivaled by few. Demographically, non-Russians, in particular ‘ethnic Muslims’, have higher birth rates than do ethnic Russians. The national identity of non-Russians is growing, and as a consequence Russians will feel, if they do not already, that they are less welcome in the national republics than hitherto. Russia incorporates almost every religion and is the only state that borders the Confucian, European, Arab, and Islamic civilizations simultaneously. The ‘border’ between the last, the increasingly troublesome Islamic world, and Russia’s Orthodox civilization runs through Russia. For these reasons, the challenge before Russia in building a democratic federal system is unparalleled. Succeeding in this challenge is of the utmost importance for the Russian state’s preservation and transformation into a market democracy. However, the temptation of a unitary state proved too strong for Russian leaders whose volkstaat — ethnic Russians — constitutes a large majority of the population (80%) spread across a tenuously inter-connected super-continent. Russia’s unitary temptation is reinforced by the recent time of troubles (the 1990s), actual and potential threats along its borders, and a growing growth gap between its economy and the globalizing international economy. In short, much in Russia works against an impulse to federalize. How has post-Soviet Russia dealt with its multi-communal challenge and the federative/unitary choice it faces? Where does Russia’s choices fall in terms of contending political science theories of ethno-national identity, nationalism, and federative and related institutional remedies to solve any problems? In recent decades various federative and other institutions have proven effective in containing communalism (the drive for self-determination based on ethnic, national, linguistic, religious, and or regional identity communities) in multinational (multi-communal) societies – that is, for preventing ethno-communal mobilization from developing into regional separatism and violent confrontation with federal authorities. Addressing this state-building challenge is particularly difficult for states that, like Russia, have large and/or numerous minority “identity communities” living in territorial concentration or national-territorial administrative units. Large states like Russia are more likely to be multi-national and federal. As Kahn points out, except for China, the largest states in the world (Argentina, Australia, Brazil, Canada, India, Russia, and the United States) are federal, except for China. And China, as it reforms economically, has seen one of the core elements of federation – decentralization – begin to creep slowly into its system of governance, establishing a form of economic or “market-preserving federalism.” Moreover, with the reunification of Hong Kong and the mainland’s desire to reunite Taiwan, the principle of divided sovereignty and political autonomy has been recognized. Perhaps with liberalization and democratization, it too will join the ranks of territorially large federal democracies and even accommodate the desire for self-determination (not necessarily independence) among Tibetans and Uighurs. Russia is both large and multi-national, with its 89 regions, 150 nationalities, and the most vast territory of any state on earth. To ensure comity within its complex panoply of ethnic, linguistic and religious communities, it is struggling to develop effective federative governance. The extent of progress, problems, risks and dangers facing the Russian state as it succeeds or fails in accommodating its various communities are the concerns of this book. There is no shortage of remedies for accommodating such complexity. Scholars have promoted various traditional and asymmetrical federal systems as well as assorted autonomy, consociational, and integrative mechanisms for managing such complex societies. Arend Lijphart logically focused on federalism and the usefulness of consociational-democratic governance, which give special power-sharing rights to national minorities or their regional autonomies such that consensual rule not majority rule is exercised. According to Lijphart, consociational federative mechanisms preclude tyrannies of the majority that frustrate ethno-national minorities’ aspirations to protect their cultural, linguistic, confessional identities from assimilative policies and their territories’ natural resources from expropriation by the Center. Traditional federalist theory and various elaborations posit the need for territorial federation or regional autonomy (self-rule, self-governance) to assuage ethno-national aspirations and undercut separatism. Democratic socialists Otto Bauer and Karl Renner proposed for the Austro-Hungarian Empire a rarely applied “corporate federalism” or non-territorial cultural autonomy for minority communities to allow extra-territorial self-governance on cultural, religious, and linguistic issues. Donald Horowitz counter-posed the prescriptions above with “integrative” ones, arguing that the former reinforce and may over-institutionalize inter-ethnic and inter-confessional cleavages and thereby weaken state integrity and provoke inter-ethnic tensions and ethno-national/regional separatism. In fact, as Sisk notes, in many cases a mix of consociational, self-governance/autonomy, and integrative measures in different combinations may be best for inducing political moderation and stability. The particular mix for a given state depends on an individual multiethnic state’s historical, ethno-national, confessional, and previous institutional peculiarities. Danspeckgruber adds that a combination of regional self-governance and extensive rights to foreign economic and cultural relations, especially intensive external regional integration, can assuage nationalist aspirations, serving conflict-prevention in various multiethnic states and conflict-resolution in Kashmir, Chechnya, and the former Yugoslavia. With the collapse of the Soviet Union’s pseudo-federal state and Mikhail Gorbachev’s belated attempt to federalize its unitary system, Boris Yeltsin permitted the emergence of a rather loose, “asymmetrical federalism” in Russia in order to placate national minorities such as the Tatars by offering them broad regional autonomy. Russia’s emerging federal system, though weakly institutionalized and democratically-embedded, fulfilled many criteria for consociationalism, autonomy/self-rule, and foreign affairs independence and/or external regional integration. However, Yeltsin’s successor, Vladimir Putin has moved to eliminate many such federative mechanisms and implemented re-centralization (de-consociationalization and de-autonomization), integrative, and even assimilative policies. As President Putin began his federative reforms, Michael Hechter extended self-rule theorizing, hypothesizing that attempts by multinational imperial and federal Centers to extend “direct rule” over peripheral regions provoke nationalism. Conversely, giving “governance units” or regions considerable autonomy assuages nationalist aspirations by granting of some political, economic, and cultural sovereignty for national minorities in multinational states. Hechter tested his hypothesis through a ‘large N’ analysis and found a positive correlation between “indirect rule” or federalism and an absence of ethnic conflict in multinational states and between the imposition of direct rule and the mobilization of ethno-nationalism. Unfortunately, there are too few cases of modern multi-national federal re-centralizing power for a statistically robust ‘large N’ study. A detailed study of relevant single cases would help fill in the gap left by the difficulty of conducting a ‘large N’ study, which renders Hechter’s study falling short in establishing causality. Putin’s efforts to re-centralize power, after a decade of legal and illegal regional autonomy and sovereignty, are well-suited for an empirical exploration of such causality and the viability of the various federative mechanisms for containing nationalism. If Putin’s federative policies provoke ethno-national mobilization, inter-ethnic conflict, or even outright separatism in Russia’s national autonomies or other regions (besides already “mobilized” Chechnya), then the salience for the containment of ethno-nationalism of self-rule, consociationalism and other federative conflict-prevention mechanisms would be confirmed. The extent to which Putin’s reforms weaken one mechanism as opposed to another may also tell us something about their relative saliency for containing nationalism. Different communal responses to different aspects of Putin’s reforms may also shed light on what stateless nations really want in terms of self-determination and why they want it. These are the concerns of this book. Before turning to the establishment, development, and reform of the post-Soviet Russian Federation a discussion of the various nationalism-limitation mechanisms is in order. Traditional democratic federalism, as it is conceptualized in theory, is quintessentially territorial. Its central tenet holds that federal and regional governments divide policy spheres between them such that each has “some activities on which it makes final decisions.” Such minimalist definitions may be compared to a more maximal definition. Arend Lijphart averred that in addition to the central-regional division of power, federalism required five secondary traits: a written constitution, bicameralism, the right of the component units to be involved in any process of amending the federal constitution and to change their own constitutions unilaterally, disproportionately strong representation of smaller governance units in the federal chamber, and decentralized government. A more contemporary definition conceptualizes federalism as the application of democratic and republican principles to the territorial, ethnic, linguistic, and even religious aspects of the population in a particular state. It presupposes the divisibility of sovereignty, power and authority among various regions and/or communities within a single state. It includes the possibility that a variety of arrangements can be struck between the federal Center and the provinces and identity communities; some organized around principles of territory, some around identity communities. There are at least three forms of autonomy from the federal Center that differentiate the federal from the unitary state: territorial, ethno-territorial (or communal-territorial), and cultural (or communal) autonomy. A fourth ‘external’ form of autonomy may be emerging as a result of the impetus toward regional and global integration. Some federations, like those of the United States, Australia, and the Federal Republic of Germany, are purely territorial. In the construction of the territorial-administrative subunits, no heed is paid to ethnic, religious, cultural identity groups. In such territorial federations the degree of decentralization or devolution of power from the Center to the federation’s subjects (states, provinces, regions) may be so extensive that it satisfies all regions and identity communities. This may require a high degree of decentralization of power and divided sovereignty. The principle of subsidiarity (which is present in many federative forms now) holds that all powers that can be efficiently exercised by a lower level of government should be exercised at the lower level. Centralization to the regional or federal level should only occur for those functions that cannot be implemented effectively at a lower level of government. The division of sovereignty is based entirely on the territorial principle, with limited and relatively equal constitutionally-based internal self-governance for all territorial-administrative subunits below the federal level regarding executive, legislative, and judiciary powers. Along with the division of sovereignty and power with regions and/or communities, the federal Center must share taxation power and/or revenues with them. Subsidiarity involving the devolution of competences must be supported by the decentralization of state finances. Fiscal federalism can take various forms. Budgetary or fiscal federalism can devolve revenues to lower sub-units through federal transfers of federal tax revenues, or more typically the sub-units may be granted their own broad taxation powers, providing revenues from which only a limited portion would be sent to federal coffers. Belgium stands out as the most centralized budgetary system among the federations with 93 percent of revenues entering the federal coffers in the first half of the 1990s on average. The figures for other federative states in the same period were: Australia – 80 percent, Austria – 70, the USA – 57, Russia – 56, Germany – 51, Canada – 50, and Switzerland – 41 percent. Without the financial means, the federation subjects’ power to execute autonomously any competences it de jure may possess exists only on paper. There is no guarantee, however, that a territorial federation, even with the greatest degree of subsidiarity and devolved fiscal federalism, can satisfice no less satisfy all of the federal state’s regions, sub-regions, ethnic and other identity groups. In this case, regions below the level of the state’s central government with compact populations of ethnic, religious, cultural or regional identity communities may have to be granted more extensive powers – ethno-territorial autonomy – from the federal government to manage their own affairs. Ethno-territorial autonomy has taken the form of, or has been referred to variously as “indirect rule (Hechter),” “self-rule,” “self-governance,” “home rule” (as in the United Kingdom), and regional “autonomy” as in Spain and Russia. Ethnic or ethno-territorial federations take the ethno-communal character of the population and regions of the country into account by creating national-territorial administrative sub-units in order that compact populations of one or several minority identity groups may receive a symbolic sense or actual degree of autonomous self-rule especially with regard to issues related to the identity group such as language, religion, education, and culture. Thus, the territorial-administrative structure of ethno-territorial federal (and confederal) states varies considerably from those with but two subjects (the Republic of Serbia and Montenegro), three in Belgium, thirteen in Canada, sixteen in Germany, thirty-two in India, and eighty-nine in the post-Soviet Russian Federation. Regarding the number of ethno-territorial governance units, it is again the Russia that comes out the leader with 32 national autonomies of three various types. It is not necessary that the autonomy of national-territorial provinces exceeds that of purely territorial administrative units regarding other issue areas, even those such as the economy, trade, and the political system. The more ‘ethnicized’ or communalized form of territorial autonomy or self-rule — ethnic or ethno-territorial federalism — can be motivated by a mixture of strategic state-building goals, including more efficient government thought best achieved by governance implemented at a ‘lower’ level ‘closer to the people’ and the prevention or assuagement of ethnic, linguistic, religious, and/or regional nationalist or communitarian aspirations for self-determination. Regardless of the motive for autonomy, the goal of self-determination through national or communitarian governance autonomy or self-rule can be implemented in several ways. In some federal states sovereignty and power outside the Center’s domain may be divided evenly among territorial sub-units. Under such “symmetrical federalism”, no region or community enjoys more sovereignty, power or privileges not possessed in equal measure by other regions and communities within the state. In reality, however, symmetrical federations are little more than an ideal type. Almost all federative states, whether territorial or ethno-territorial, are asymmetrical to one degree or another. In some cases, asymmetry arises out of practice and in the interstices of the constitution and law. In others, as in Spain, India, and Russia, it is consciously mandated by constitutions, laws, and even treaties signed between regions and the federal Center. In any particular federal system, moreover, some jurisdictions may be shared with regions or communities on an equal basis, while other jurisdictions are divided below the federal level on an asymmetrical basis. For example, some regions may be allowed more taxation power or revenue-sharing than others in an effort to ‘level’ socio-economic conditions and standards of living across the federation or to buy off potentially secession-inclined regions. Finally, it may not be that the division of sovereignty between the federal Center and the regions is clear cut. To be sure, there are federal systems where some functions, such as police or firefighting functions, are the sole competency of sub-federal entities. However, quite often whole spheres of competency are divided into several categories. Some spheres of activity may be the sole purview of the federal government, some under the sole jurisdiction of regions or communities, and some may be placed under joint federal-regional jurisdiction as in India and Russia. Furthermore, sub-regional governments of cities or even less-populated and smaller administrative units may share or enjoy partial or sole sovereignty in certain spheres. In sum, the more traditional forms of territorial and ethno-territorial federalism include a variety of forms that can be deployed in different combinations, providing considerable flexibility for alternative distributions of power and authority designed to the tenor of any particular state’s time and place. Bauer’s and Renner’s cultural autonomy or “corporate federalism” has certain advantages over territorial federalism or regional autonomy, but it has been applied rarely. Only pre-war Estonia, the 1960 Cyprus constitution, and the 1970 and 1991 Belgian constitutions have provided for extensive corporate federations. From 1970 Belgium had mixed territorial, ethno-communal, and communal (corporate) forms of federalism, having established 9 territorial provinces, 3 ethno-communal regions (Flanders, Wallonia, multi-communal Brussels), 4 language-based regions (Dutch, French, German, and Brussels, which is bilingual), and three cultural autonomies for Dutch, French, and German communities. In 1991 consociational procedural rules in decision-making and law-making were established in legislative councils based on both territorial and cultural principles and in the executive branch based on coalition-making along linguistic lines. Elsewhere, some limited experimentation has occurred. In May 2003, post-communist and independent ‘post-Yugoslavia’ Croatia implemented an element of what might be called limited consociational cultural autonomy. Members of Croatia’s national minorities elected Minority Councils which are mandated by law to be informed of all pending legislation affecting identity communities. They have the right to request the Justice Ministry to vet and amend or repeal any such law and that it determines violates minority constitutional rights. The fundamental principle of such communal autonomy, in addition to its non-territorial basis, is that cultural, linguistic, ethnic and/or religious communities is “rule by the minority over itself in the area of the minority’s exclusive concern.” Thus, a religious minority like the Shiites in Iraq would have exclusive control over issues related to Shi’a Islam within their community across Iraq not just in a Shiite republic in southern Iraq. Chechens and Tatars would have jurisdiction over cultural, language and religious issues for their respective communities across the Russian Federation not simply in Chechnya or Tatarstan. This method of autonomy has the advantage of not subjecting other minorities in the given region to the preferences in culture, language or religion of the regional majority. Whether territorial, ethnic, or corporate federalism or some combination of each is employed, a carefully calibrated division, separation and balance of power between ethno-communal or territorial administrative units and/or identity communities, on the one hand, and the federal Center, on the other, can assuage the desire for self-determination in regions and/or communities, obviating their resort to separatism and secession. As an alternative method of satisficing the impulse for self-determination, the division of sovereignty may alter the means employed by radical secessionists operating under “value rationality” — rationality defined in terms of a hierarchy of religious, ethnic, linguistic, territorial, cultural or other values rather than ‘economic’ cost-benefit analysis — in their quest for self-determination outside the state. It may change the cost-benefit “instrumental-rational” calculus of communitarianists/nationalists after mass mobilization such that a portion of the secessionist movement can be co-opted into a bargain involving within-state self-determination. Furthermore, in an era of globalization, regionalization, multiple loci of sovereignty, and multiple foci of individuals’ identity and loyalty, it would seem that regional and even cultural self-rule or autonomy are often the most appropriate, indeed indispensable instruments for maintaining state stability. Indeed, “asymmetrical” confederal, federal, and mixed confederal-federal arrangements may become the rule, as states delegate increasingly larger portions of their sovereignty and powers to governance units both above and below the state level. There are circumstances under which it may be advantageous to supplement territorial, ethno-territorial, and cultural forms of autonomy within the state with arrangements that provide regions seeking self-determination with certain external competencies. External competencies that might be afforded regional autonomies representing certain identity communities can include authority to conduct at least some foreign trade, economic, and cultural affairs independently from the Center, foreign representation, membership in regional and international organizations, in-put into foreign policy-making, or, more rarely, foreign treaty-making power. These can give to state-less nations or other identity groups some of the elements of external self-determination (independence) without the risks (civil war) of seeking, and the difficulties (financing military and other national security institutions) of maintaining de jure independence. Such elements of external autonomy and sovereignty can be provided in two ways. First, the Center can come to agreement with the regions of minority identity communities on devolving authority in spheres such as foreign trade, economic, and cultural ties and other foreign affairs functions to regions. Second, regions can be connected to foreign states, peoples, and markets through its external regional and international integration; that is, through its state’s integration into regional and international organizations and regimes, a sub-federal regional autonomy will be integrated into them as well. Regional and international integration plus autonomy is a potentially viable supplementary mechanism to obviate radical communalism and separatism. Unions, commonwealths, confederations, and international governmental and regional organizations and regimes add another locus of sovereignty within their member-states. The member-states and their sub-federal administrative or national territorial units also receive new partners outside the federal Center with which to establish ties and share sovereignty. Such multi-state structures also create multiple identities among their citizens. Such a sensibility, when combined with other elements of external and internal autonomy, should undercut communalist aspirations for self-determination through secession. The rationales for dividing sovereignty and devolving authorities to sub-federal levels, beyond the overarching strategic goal of containing secessionist nationalism, are several. Subsidiarity provides for more effective governance, since regional and sub-regional (local) officials, being situated closer to the population, have a better understanding regarding which policies are best suited for their constituents and locales and most politically viable in their constituencies. Ethno-territorial, cultural, and external autonomy are inspired by the need to address communal aspirations for self-determination. However, the decentralization and the reinforcement of communal cleavages these entail are not the only legitimate ways of organizing multi-communal relations within a state. To the contrary, as Donald Horowitz has argued, integrative measures can strengthen a multi-communal federal political system. The same may be true of a modicum of assimilative practices. Arend Lijphart argued that consensual or “consociational” democracies are better-suited than majoritarian or Westministerian democratic orders to address heterogeneous polities. As the leading proponent of consociationalism, he pointed to several “majority-constraining” components of consociational democracy. (1) executive power-sharing and a grand coalition government, including representatives of all major linguistic and religious groups; (2) proportionality in political representation and civil service appointments; (3) a bicameral federal parliament, the upper chamber of which provides equal representation to national minorities and/or regions and is approximately equal in power to the lower chamber; (4) a written constitution that provides for a minority veto with regard to vital minority rights and autonomy; and (5) territorial and/or non-territorial (corporate) federalism. Lijphart held up Belgium as well as India’s power-sharing system as models, despite some decay in the latter’s system after 1966, for providing the flexibility that a linguistically, ethnically and religiously divided country needed to accommodate such varied interests. For Lijphart, India confirmed rather than confounded the expectations of consociational theory. The breakdown of perestroika’s democratizing transition and the collapse of the Soviet state stands in stark contrast to the survival of linguistically- and religiously-divided India’s consociational democracy. In the equally ethnically and confessionally complex former Soviet Union and post-Soviet Russia the institution of at least some consociational mechanisms during the Soviet/post-Soviet transition could have helped prevent the Soviet collapse. Similarly, they and other power-sharing mechanisms might help the Russian Federation avert the Soviet fate. Many aspects of late perestroika policy and pact-making suggest development toward the kind of institutions and power-sharing arrangements that could have led to a transition to democracy, a phased dismantling of the Union based on a ‘friendly divorce’ of some union republics, and the formation of a loose federation or confederation. Perestroika’s pact-making under the Union Treaty heralded aspects of the four essential power-sharing arrangements Lijphart valued. By the eve of the August 1991 coup, Gorbachev seemed to have cobbled together a crude form of the most important of these: a grand coalition of leaders from the union republics and some of the autonomous republics and smaller national-territorial administrative units. A multi-party system and balanced bicameralism were also envisioned by the Union Treaty. However, these transformations came to late to salvage even a rump of the Soviet Union in the end. The salience of consociational institutions is writ large by the contrast between the Indian and Soviet outcomes: India’s consolidation of a democratic transition versus the aborted Soviet Union’s collapse and its nascent transition’s devolution into state bureaucrat-led revolution from above. After the signing of Gorbachev’s nascent Soviet transition pact — the draft Union Treaty — was aborted by the failed August 1991 hardline coup, Yeltsin consummated his creeping revolution from above begun with Russia’s June 1990 Declaration of Sovereignty. Ultimately, as Chapter 2 discusses, Yeltsin chose a different set of consociational and other mechanisms to stabilize a new Russian Federation. Excluding Chechnya, this approach was rather effective in addressing nationalist aspirations for self-rule and highly valued by regional elites. Minimal consociational mechanisms under Yeltsin included bicameralism and what might be referred to as a legally-constituted conciliation procedure that allowed the regions to force federal-regional negotiations regarding draft federal legislation. This procedure, written into federal law and discussed in later chapters, although not quite a constitutionally-mandated minority veto, was far more robust than conciliation procedures based merely on parliamentary regulation. However, both mechanisms would be significantly diluted under Putin. There are problems with Lijphart’s conceptualization of what constitutes the set of ‘consociational’ mechanisms. First, since consociational decision-making presupposes a consensual process, it seems inappropriate to include what are variously called autonomy, sovereignty, self-rule, or self-governance federative mechanisms; what Lijphart refers to as territorial and non-territorial federalism. Territorial federalism, the decentralization of significant powers to semi-autonomous and semi-sovereign administrative-territorial or self-governance units, does not establish necessarily consensual decision-making procedures and mechanisms. Rather, it usually divides competences between levels of government, creating spheres for separate decision-making. Only, the creation of joint federal-regional competences can provide a space for consensual work by setting aside issue areas where federal and sub-federal officials must bargain to develop policy and pass laws. The non-consociational nature of territorial federation’s regional self-rule is also true for corporate federation’s cultural autonomy. A separate sphere – issue areas such as language, culture, and education policy – is set aside for minority linguistic, ethnic, religious, and even cultural communities, who possess the sole authority to legislate, administer, and even adjudicate in these policy spheres. No consensual or other form of agreement by federal authorities is required unless mandated otherwise. These are better included under the separate category of nationalism-limitation mechanism I will refer to autonomous rule, self-rule, or self-governance. For these reasons, I will use the term ‘consociational’ to refer to those mechanisms that facilitate regional or minority community participation in decision-making at the federal level or joint federal-regional, majority-minority decision-making, such as minority veto, federal-regional agreements on shared power and decision-making, and multi-communal executive rotation and/or grand coalitions (as in the equal number of Flemish and Francophone ministers in Belgium’s government mandated by the constitution and the rotating presidencies of post-Tito Yugoslavia or post-Yugoslavia Bosnia-Herzogovina). Second, as has been argued by Horowitz and others, provision for proportional representation in parliament, minority group parties, and multi-dimensional parties gives no guarantee that leaders will forego ethnic, linguistic, or religious entrepreneurship and work toward consensus with competing parties of ‘other’ groups. Competition and “elite-driven conflict” are as likely to trump consensus-building. Horowitz’s integrative prescriptions to ensure inter-group coalition-building ensues before elections rather than assuming it would occur after them follows the logic of this critique. Integrative and some assimilative measures are best employed as complimentary rather than as an alternative to consociationalism and autonomy in federal systems. Mixing and matching combinations of the former mechanisms with combinations of the latter type, as appropriate for the case, can prudently counterbalance the centrifugal and divisive tendencies of the latter to legislate, ‘lock in’, and heighten the salience of communal self-identity. Donald Horowitz proposed vote-polling electoral systems as a mechanism for discouraging ethnic parties, prompting moderation on the part of the majority, preventing the exclusion of minorities, and creating multi-communal election coalitions, multi-ethnic parties, and thus inter-communal government coalitions in parliamentary systems. Preference voting, for example, allows voters to cast for their first preference party or candidate, but also second and even third preferences, which are tallied in the vote counting along with the first preference votes. This should restrain would-be ethnic entrepreneurs from campaigning on ethno-national platforms, as they would need to take into account the possibility that a majority of first-preference votes won among the candidate’s compatriots might not ensure ultimate victory and that to win the candidate must appeal to voters from other identity groups other than his or her own. Alternative vote systems, for example, provide for the redistribution of second and third preference votes on a pre-determined basis if no candidate manages to win a majority of votes. Transfer voting systems that allow candidates to ally to pool votes are also championed by Horowitz. The Malaysian alternative voting system has been touted not only by Horowitz but also by Lijphart, Sisk, and Hechter as a successful example of deploying such systems to undercut interethnic cleavages, in this case between Malay and the large Chinese minority. Hechter rightly cautions that the small number of cases (Papua New Guinea, Malaysia and largely homogenous Australia) does not allow a conclusion that such systems trump other factors that may create, maintain or exacerbate inter-ethnic cleavages. Rather than as an alternative to consociational decision-making, such electoral systems should be seen as moderating the inter-communal cleavages reinforced by autonomy and consociational mechanisms. Sisk adds that integrative arrangements need not be confined to electoral ones and that integrated executive, legislative, and administrative decision-making and ethnicity-blind public policies can be effectively applied under certain circumstances. In states where political elites are integrated and the main political cleavages are not those between identity groups majoritarian decision-making is more efficient than consensual methods. In the post-Soviet Russian case, there is some reason to believe that the state’s elite, consisting largely of Soviet era bureaucrats, other members of the communist nomenklatura, and their children, still possesses a fairly well-integrated worldview. However, it can also be argued that ethnic identities and ethnopolitical mobilization have been limited (excluding Chechnya and perhaps Tatarstan)) to date only because democratization is far from complete and that in future democratization could spark growing demands for greater autonomy and consociationalism. Therefore, a turn to integrative and assimilative measures exclusively would be dangerous. Furthermore, Sisk recommends “integrative options” which in some ways are as much consociational as they are integrative in as much as they are post-electoral. They include: (1) the use of “special majorities on key issues in both cabinet and legislative institutions (for example, through innovative parliamentary rules)” to replace grand coalitions and majority vetoes for identity communities and (2) “(i)nclusive, legitimate, and authoritative arbiters of conflict” such as special commissions and judicial bodies. A liberal model of integrative public policies proposed by Sisk and others that protects group rights only by protecting individual rights is suitable where communal mobilization is unlikely and there has been no historical inequality. A model of assimilative policies in education, language, and culture, combined with strong civil and political rights’ guarantees, seems practically applicable to but a limited number of states like unitary France. In European federations and quasi-federations like Spain, Belgium, and the United Kingdom, education, culture, and language policies have been highly decentralized, handed over to sub-units like the Basque Country, the Flemish and Francophone regions, and to Scotland, Wales, and Ireland, respectively. Even in the United States, where communal mobilization has been limited historically and racial groups have strived for individual civil rights not group privileges (at least initially), assimilative education has given way to specialized Spanish-language education for Spanish-speaking immigrants, affirmative action for a variety of minorities, and balkanized university hiring practices and education programs focused on the histories and interests of various minorities. Regardless of how one categorizes the mechanisms for containing communalism outlined above, it is clear that some combination of selections from the menu of remedies for secessionist communalism can effectively address many issues related to most multinational states’ communal makeup and politics. What may appear to be a good design for one place (state) or time (one period of time in the same state) may be unsuitable for another place or time. To be sure, the institutional design will never be ‘rational’ in the sense of a single decision-maker assessing the best design for a given state. All designs of democratic federal systems are the products of political competition and negotiation. In some cases a successful remedy may not be agreeable to all parties, leading to some combination of events including separatism, repression, and/or civil war. In sum, there is a need for a flexible approach to state-building that allows for a broad range of relationships within a single state and transformations of those relationships when circumstances warrant. A mix of measures taken from the rich menu of asymmetrical ethno-territorial and/or corporate federalism, consociationalism, and some integrative mechanisms based on the concept of the “plurinational state” offers the appropriate flexibility in the institutional design and conceptualization of the relationship between identity groups and the state necessary for many multi-communal states. Today’s world is undergoing a transition to one pervaded by numerous international regimes/organizations and supra-state and sub-state transnational actors. The new “transnationalism” has spawned ‘trans-state’ and sub-state perspectives on sovereignty that have eroded significantly the salience of state sovereignty. As Michael Keating notes, this “post-sovereignty” era marks a rebirth, not the discovery, of multiple sovereignty, and the nation-state era may be the historical anomaly. In this new world, a more malleable concept of sovereignty in theory is making for an increasingly divisible sovereignty in practice. Global and regional governmental organizations and regimes divide state sovereignty. Several loci of sovereignty can and often do exist within a single even unitary state. In a federative state joined to one of these multi-state structures, sovereignty is diffused across three levels: the multi-state, federal state, and sub-federal levels. In the case of corporate federalism (non-territorial, cultural autonomy), it takes a non-territorial, trans-regional form. European regionalization under the European Union’s set of regimes and institutions is cited most often as a potentially successful model of creating such multiple loci of sovereignty, thus breaking down the hegemony of state sovereignty. Such arrangements open up possibilities for regions to interact with other states, peoples, and (regional and global) markets. They also create multiple identities for citizens – plurinationality. Thus, a citizen of Spanish Catalonia regards oneself as Catalan, Spanish, and European. A resident of Chechnya might one day consider oneself a citizen of Chechnya, the Russian Federation, and a future reconstituted rump of the former USSR (which would have to offer Muslim former republics an equal role to assuage elements of Chechen Islamic nationalism provoked by the two post-Soviet Russian-Chechen wars). Minority communities seeking self-determination do not need and increasingly do not seek to secede in order to achieve their goal, as public opinion and party politics in British Wales and Scotland, Spanish Catalonia, Canadian Quebec and even Russian Tatarstan and other national autonomies seem to show. This may explain the decline in inter-ethnic and secessionist violence globally in the late 1990s. Communalisms — ethnic, religious, cultural and/or territorial ‘nationalisms’ — increasingly are satisficed, if not satisfied by internal self-determination ‘limited to’ broad autonomy and self-governance in both internal and external affairs. To be sure, there are exceptions – Indian Kashmir and Russian Chechnya – but they seem only to prove the rule. An international regime for building communal self determination in such thorny cases may not be too far in the offing. In this new era, federations, confederations, unions and international and regional governmental organizations and regimes are more likely to be asymmetrical. Each sub-unit of federal states and each state within a confederation, union, alliance, or other multi-state organization may have different relationships with the federal Center or multi-state organization, respectively. Plurinationality can be reflected in some mix of several kinds of federalism, autonomy, and asymmetry. Oddly, the most plurinational state on the globe may be the United Kingdom, which has never declared, no less constitutionalized any form of federalism. Over the last decade, along with the establishment of parliaments for Scotland, Wales and Northern Ireland, the UK has opted for asymmetrical federalism that includes both consociational and decentralizing asymmetries. In some federations, the Center may develop treaty federalism with some sub-federal units and not with others, depending on sub-federal demand. Generally, the more multi-communal (multinational, multilingual and/or multi-confessional) states are, the more asymmetric are their federations (post-Soviet Russia, India, Spain, Belgium, Canada. The UK’s undeclared, non-constitutional asymmetric federalism or multiple federacy has afforded autonomy and parliaments to not only Northern Ireland, but to Scotland and Wales in recent years. Even China moved toward an asymmetrical ‘economic federalism’ that has established various types of free trade and economic zones to tens of its provinces. Sub-federal territories or identity groups with which the Center signs special agreements may receive varying degrees of overall autonomy, different spheres of autonomy or competences, and/or different degrees of power within individual competences. Even those subunits that do not sign treaties or agreements with the Center are likely to have different arrangements with the Center through, for example, constitutionally-based divisions of competence or through asymmetrical budgetary and taxation powers. “Incongruent federations” are well-suited for such plurinational, asymmetrical federative systems. Incongruent federations (as well incongruent unitary systems) are those states which have sub-units with social and cultural (communitarian – that is, ethnic, linguistic, religious) “compositions that are different from each other and from the country as a whole.” Asymmetry is more likely in, and best suited to such countries where identity groups are territorially concentrated or where some are ethno-politically mobilized and others are not, requiring differentiated and carefully calibrated institutional responses to different communities. When differentiation comes in the form of special rights and privileges for some groups and not others, of course, the latter less privileged regions or communities may seek equal status. These less privileged, previously less mobilized, may be provoked into ethno-political mobilization. Thus, there is a real risk of an ever-escalating competition for special rights within the asymmetrical federation that may bring some to opt for secession. Russia certainly represents an incongruent federation writ large, and it is perhaps the penultimate, most multifarious and complex such ‘multinational or nested nation’ among the federative states, except, perhaps, for India. And its ethno-territorial asymmetry favoring the national autonomies has provoked some separatism (Chechnya) and some majority dismay (in predominantly ethnic Russian regions). Asymmetry can be of various kinds. Institutional-constitutional asymmetry involves the creation of special territorial-administrative structures and “channels between the federal government and a particular constituent unit that is favored with special privileges, dispensations, and exceptions vis-à-vis other constituent units of the federation.” Russia’s three-tier myatroshka national-territorial administrative structure creates just such relations and arrangements between national okrugs, on the one hand, and the federal Center and other federation subjects, on the other. Thus, the Khantsy-Mansii and Yamalo-Nenets National Okrugs are located within Tyumen’ Oblast and send portions of its tax revenues to Tyumen’s coffers is like the oblast a federation subject also with two senators in the Federal Assembly’s federal chamber, the Federation Council. A federation may include “aconstitutional asymmetry” which, given its nature “outside the law” – that is, having “bilateral relations between federal and regional levels that neither seek justification within, or even relate to, the founding document of the federal union” — “is corrosive of federal arrangements” of the rule of law as well. The other body of literature, exemplified by Horowitz, as noted above, also argues the corrosiveness inherent in policies that highlight minorities’ ‘otherness’ through a focus on it by either discrimination or privilege — as Yeltsin’s hyper-federalism did — the Center is more likely to strengthen communal self-identity; a precondition for ethno-politicization. Under two consecutive Kremlin leaders Russia has implemented two ‘provocative’ but contradictory policies to contain communalism – institutional (and policy) concessions to the national autonomies under Yeltsin and revoking those concessions under Putin. The above theories combined suggest that this is the worst of policy mixes – provoking communal self-identification (as Yeltsin arguable did) and then retracting regional autonomy and dismantling the federative and related institutions that might absorb it by providing minority representation and ethno-regional autonomy. The combined sequence should have provoked non-institutionalized ethno-politicization: ethno-politics ‘underground’ and on the streets. Thus, the provocative nature of Putin’s aggressive and sweeping Putin’s federative counter-reforms (and some related policies, such as language policy) provide an opportunity to test: (1) the viability of Russia’s capacity to contain communalism; (2) the hypothesis that the imposition or re-imposition of direct rule will provoke communal mobilization and even separatism; and (3) whether today’s Islam or Muslim nationalities, at least in Russia and/or as influenced from abroad, may be more prone to religious communalism than other religious identity communities. If Russia’s Muslims are potentially highly ‘mobilizational’, then a provocative sequence of identity-provoking policies should have produced a Muslim backlash in Russia’s Muslim regions more than in its non-Muslim ethno-territorial regions. Under Yeltsin, Russia continued to suffer the consequences of the collapsing Soviet state apparatus and was forced to make concessions to rising nationalist sentiment in many Russian regions, but especially in Chechnya and Tatarstan. Those concessions prevented or at least forestalled conflict in the latter but not in the former, leading to the rise in Chechnya of the ultra-nationalism of the Chechen Republic of Ichkeriya, two post-Soviet Chechen-Russian wars, and the rise of global jihadism under the Caucasus Emirate. Yeltsin’s concessions produced the very aconstitutional asymmetry of which the federalism literature warns. 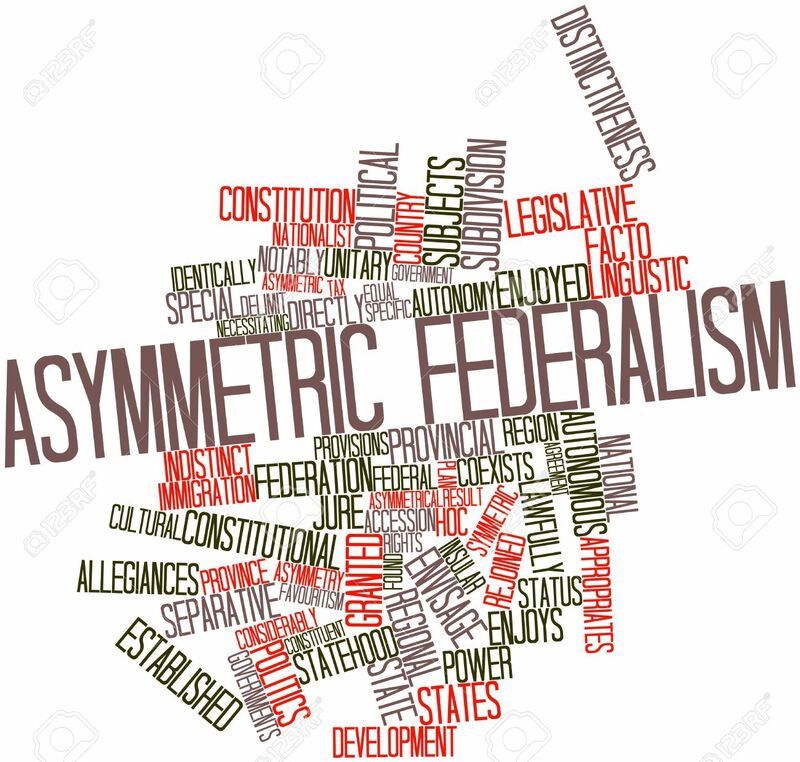 What I have called “official asymmetry” –unequal bilateral relations between the federal government and individual federation subjects based on special treaties and agreements — further compounded post-Soviet Russia’s aconstitutional asymmetry. Some of the federation’s regions and/or identity groups enjoy a different number and/or degree of competences devolved to them through bilateral federal-regional treaties and attendant agreements. Asymmetry is often expressed in special fiscal privileges. The tenuous institutionalization of this asymmetrical autonomy, decentralization, devolution or division of competencies has been the problem. The federal-regional power-sharing treaties and agreements are only minimally ‘constitutionalized,’ having been only briefly mentioned and thus legalized in the Constitution’s Article 11. However, many of the 42 treaties and hundreds of attendant agreements signed between Moscow and 46 of Russia’s regions violated federal law and the Constitution. This created real questions as to the supremacy of the constitution as the federation’s founding document and provided the basis for a plethora of regional laws that also violated federal legal norms. As the Yeltsin era came to a close, a real question arose as to whether the federation was actually a treaty-based confederation. Some regions, not having signed the 1992 Federation Treaty or ratified the 1993 Russian Constitution (Chechnya and Tatarstan), pushed for a concept of federalism based purely on treaty relations. This view holds a constitution for union as a treaty between equally sovereign entities that are free to secede as desired, approximating the Calhounian “doctrine of nullification” that helped precipitate the American Civil War. The constitution is not to be interpreted as creating a supreme law founding a united sovereign state that binds lesser sovereign entities to it. Whereas institutional asymmetry is often undemocratic, official asymmetry undermines federal arrangements and may subvert the rule of law. What I have referred to as “unofficial asymmetry” in Russia, involving violations of federal law and the Constitution in numerous regional (or sub-regional) laws, constitutions or charters, clearly subverts the rule of law, federation, and democracy. Unofficial asymmetries are anti-constitutional and illegal and were rampant in Yeltsin’s Russia, making its federation the only one that suffered from all four forms of problematic asymmetry. Indeed, in no other federation in history, whether developed or developing, have all three forms of asymmetry (institutional, aconstitutional/official, and unofficial/illegal) been so pervasive as in the post-Soviet Russian federation. Much in each of these asymmetries has its roots in Soviet Union’s ethno-territorial administrative structure, which gave birth to its matryoshka-like structure inherited by Russia, and the great disparity between the Soviet constitution’s words and the party-state’s actual operational deeds. Official asymmetry under corporate federalism (cultural autonomy) is appropriate where one or more communities are dispersed across a state’s territory (making territorial-autonomy impossible) but only some are ethno-political or some are less mobilized than others. Regions and/or groups also may have special rights in participating in decision-making at the federal level. This asymmetrical consociationalism, it should be stressed, must be more than mere representation of national or territorial units or identity groups at the Center. Bicameralism does not automatically yield consociational parliamentarism. For example, in the post-Soviet Russian Federation, the 32 national autonomies each have two senators in the upper chamber of the Federal Assembly, the Federation Council. However, since votes are taken on a majority basis, most bills can be passed even if all the national autonomies’ senators vote against them or abstain. For federalism, no less hyper-federative systems like plurinationality to work, representation must be translated into the regions’ and/or identity communities’ real participation and influence in the decision-making process and preferably require consensus among federal authorities and said regions or communities. Yeltsin’s Russia rivaled, if not surpassed the UK’s level of plurinationality. During the Soviet collapse and its aftermath, political expediency rather than pre-planned institutional design forced President Boris Yeltsin to hold the Russian Federation together using many of the above methodologies in an ad hoc mixture. Through negotiation and experimentation, the federation seemed to stumble upon an asymmetrical form of federation not far off the path that leads to a plurinational state. However, fears that the degree of autonomy afforded many regions in combination with the weakening of the state brought about by the 1998 financial crisis followed by the rekindling of the war in Chechnya seem to have prompted Yeltsin’s hand-picked successor, Vladimir Putin, to roll back much of Yeltsin’s developing plurinational system that appeared to containing separatist communalism outside of Chechnya. During Putin’s first term as president he implemented a series of anti-federative counter-reforms that led to Russia’s transformation from a hyper-federative state to a unitary one. Given the radical and often ineffective nature of Yeltsin’s hyper-federative system, born in and consisting to a considerable degree of the rubble of the Soviet collapse, certain some rolling back of the hyper-federalism’s aconstitutional asymmetry was called for. In this author’s view Putin’s counter-reforms went too far in dismantling Russian federalism. The first counter-reform was the creation of extra-constitutional federal districts [FOs] to restore the ‘executive vertical’ – that is, ’federal control over the its agencies located in the regions – but also to coordinate federal authorities’ interference in regional politics, especially elections through the use of administrative resources (police, courts, tax collection, finances, state mass media). Second, Putin implemented a hyper-centralization of law-making, requiring regional laws to comply with federal law under a federal Constitution which renders federal law supreme in all spheres of life that it chooses to address. Third was the the creation of a mechanism for ‘federal intervention’ allowing the president with court approval to remove a regional governor or republic president and call elections to a regional parliament should they refuse to follow court findings that regional executive branch decrees or orders, legislative acts, or constitutions violate the Constitution or federal law. The fourth counter-reform, implemented over a period of years and into Putin’s second term, was termination of most, if not all power-sharing treaties between the federal government and individual regions, ending regional autonomy and official federative asymmetry. Fifth came several counter-reforms of the Federation Council from a legislative body composed of elected officials to one of officials appointed by the Russian president and then back to a partially elected body. Sixth was a significant re-centralization of budget revenues. Seventh was Putin’s dissolution of the national autonomous okrugs. Eighth, Putin de facto eliminated the consociational minority veto for region legislatures over draft federal legislation. Post-Beslan, presidential appointment replaced rather the popular election of regional governors and republic presidents, though this was repealed in favor of a mixed appointment-electoral model, with candidate nominees for elections proposed and then later merely approved by the president. Also, single-mandate districts seats in the State Duma were eliminated and a fully PR or party list voting system was introduced, with reversion to the mixed single-mandate/PR system in 2016. Policies related to Putin’s counter-federative revolution included several assimilative policies, including bans on ethnic and religious parties and on the use of non-Cyrillic alphabets; the latter being a response to Muslim Tatarstan’s decision to Latinize the Tatar language. Muslims mobilized to block two other assimilationist policy proposals: the introduction of a course on Russian Christian Orthodox ‘culture’ into Russia’s schools (instead a policy giving parents a choice between several different religions to study, the study of ethics, or the history of religions and an initiative forbidding Muslim women from wearing the khizhab (vail) in passport photographs. In sum, the wave of nationalism in the late Soviet period was sparked as much by the previous historical repression of nationalist identity, the previous formal rather than real institutionalization of ethnicity, and the subsequent liberalization of culture and media during perestroika, which facilitated demands for the realization of real federalism or at least national-territorial autonomy or ‘sovereignty’ in place of communism’s formal, indeed fictive federalism. Combined with state failure and political division in the metropole, the revival of national identity and the rise of nationalism in the union and autonomous Soviet republics led to the dissolution of the Soviet state. Despite carrying out two very different policies, each of which political science theories expect should provoke ethnonational political mobilization, post-Soviet Russia managed to avoid a rise of ethnonationalism and separatism. Yeltsin’s hyper-federalism appears to have put a stop to that dissolution at the union republic level, except for Chechnya. The only exception – Chechnya – arose as a result of the Soviet collapse before post-Soviet Russia could establish a consolidated institutional framework for addressing problems of radical ethno-nationalism and mass mobilization. When undertaken Yeltsin’s policies strongly highlighted and encouraged separate ethnic identification, repeating the same mistake that the USSR did in institutionalizing ethnicity. The democratic nature and real, indeed extreme federative content of the early post-Soviet Russian system in contrast to the Soviet system may explain why a significant national separatist movement did not develop outside Chechnya — say, elsewhere in the Muslim North Caucasus, in Muslim Tatarstan, or in non-Muslim national republics as it might have. Putin’s rollback of federalism and creation of a unitary state also did not produce a wave of ethnonational resistance. There was no mass mobilization of ethnic or religious minorities. Opposition to centralization and de-federalization was minimal even in Tatarstan – the republic that ‘from below’ drove the original federalization in partnership with Moscow. In the North Caucasus, no national separatist movement emerged on the tail of Putin’s counter-reforms. The explosion of the second Chechen war had little to nothing to do with these policies and much to do with the simmering first Chechen war and the jihadization of the Chechen Republic of Ichkeriya (ChRI). Instead, the jihadization of the ultra-nationalist ChRI separatist movement helped — in tandem with the global jihadist movement — to infect neighboring republics, especially Dagestan and lesser so Ingushetiya, with jihadism. This development was also driven by the domestic culture of blood revenge and corruption and Russia’s general lack of rule of law and democracy, not a surfeit of federalism, for which there was little demand outside of Dagestan and which was dismantled in Dagestan after the rise of jihadi jamaats in Dagestan. The result as the rise of the small but violently powerful Caucasus Emirate (CE) jihadi organization in the ChRI’s place. The CE made no demands for Chechen authonomy and promoted the global jihadist theo-ideology and the creation of a global caliphate. Putin’s defederalization policies had more to do with fears driven by the first Chechen war, traditional Russian political culture, and the new president’s particular political inclinations. The fact that they did not provoke a nationalist backlash suggests that soft authoritarian recentralization can avoid a mobilizational backlash against re-centralization – at least until the next round of liberalization, decentralization and/or state-regime dysfunction. One caveat to the at least temporary ‘success’ of Putin’s soft authoritarian re-centralization is that Chechen mobilization seems to have mutated into a not very stealthy form of national-territorial autonomy under the thumb of Ramzan Kadyrov. Singularly now in the Russian ‘federation’, Chechnya enjoys ‘aconstitutional’ or ‘extra-constitutional’ unofficial asymmetry, with Chechen women required to wear the headscarf when in state institutions, including universities and schools. Kadyrov commands a 10,000-armed police force ostensibly subordinated to the newly created National Guard but still not so subordinated. Kadyrov likely stands behind the murders of Novaya gazeta journalist Anna Politkovskaya and pro-democracy politician Boris Nemtsov, and yet Moscow is unable (or unwilling) to move against Kadyrov for these crimes, since he would likely be able to resist arrest or if arrested would become the cause for a new Chechen uprising led by the chiefs of his allied teips and Sufi order, in particular the Qadiriyya Sufi tariqat. In other words, in Chechnya the Russian state remains afflicted by weakness, unofficial asymmetry, and a kind of stealth separatism that are likely to be exacerbated during any liberalization, decentralization, or more generalized state and/or regime weakness. Despite the ‘effectiveness’ of Putin’s soft authoritarian re-centralization, as under the more liberalized Yeltsin regime democratic systems or authoritarian systems in crisis or a post-crisis situation are likely to benefit from the use of some mix of federative remedies. In western central Eurasia, this is probably true for democratic Moldova and crisis Ukraine. In the former, the election of Igor Didon as president in Kishinev has created an opening for a resolution of the frozen conflict with Transdniestr, and Didon has proposed federalization of relations between Kishinev and Tiraspol as part of an ultimate solution. In Ukraine, only considerable autonomy for Donbass can restore Kiev’s sovereignty over its eastern regions and ensure its control over western Romanian- and Hungarian-majority regions. In Eurasia writ large, federative mechanisms may be the only way to put states like Iraq and Syria back together if and when the scourges of civil war, Al Qaida, and the Islamic State end. Ultimately, no generalized rule for the application of federative or centralizing mechanisms can be confirmed. Each state’s structure, internal culture and politics determine which, if any, among the federative (or non-federative) arrangements will ultimately be utilized in any one country. The concept ‘identity communities’ is used rather than Ted Robert Gurr’s “indentity groups” in order emphasize the various ethnic, confessional (religious), linguistic and/or cultural aspects that may bind a set of individuals together rather than the organizational connotation of the word ‘group’. Ted Robert Gurr, Minorities at Risk: A Global View of Ethnopolitical Conflicts (Washington, D.C.: United Institute of Peace, 1993). Jeffrey Kahn, Federalism, Democratization, and the Rule of Law in Russia (Oxford: Oxford University Press, 2002), p. 18 and footnote 2, p. 18. See Gabriella Montinola, Yinggyi Qian, and Barry Weingast, “Federalism, Chinese Style: The Political Basis for Economic Success,” World Politics, Vol. 48, No. 1, 1996, pp. 50-81 and Minxin Pei, “Self-Administration and Local Autonomy: Reconciling Conflicting Interests in China,” in Wolfgang Danspeckgruber, ed. The Self-Determination of Peoples: Community, Nation, and State in an Interdependent World (Boulder: Lynne Reinner Publishers, 2002), pp. 315-32. Michael C. Davis, “The Case for Chinese Federalism,” Journal of Democracy, Vol. 10, No. 2, April 1999, pp. 124-37. Arend Lijphart, Democracies: Patterns of Majoritarian and Concensus Government in Twenty-One Countrires (New Haven: Yale University Press, 1984); Arend Lijphart, “The Puzzle of Indian Democracy: A Consociational Interpretation,” American Political Science Review, Vol. 90, No. 2, June 1996, 258-268. William H. Riker, Federalism: Origin, Operation, Significance (Boston. Mass. : Little-Brown, 1964); Carl J. Freidrich, Trends of Federalsim in Theory and Practice (New York: Praeger, 1968); Michael Hechter, Containing Nationalism (Oxford: Oxford University Press, 2000); and Danspeckgruber, The Self-Determination of Peoples. Freidrich, Trends of Federalsim in Theory and Practice; Lijphart, Democracies, pp. 183-84; and Walker Connor, The National Question in Marxist-Leninist Theory and Strategy (Princeton, N.J.: Princeton University Press, 1984, pp. 28-9. Donald L. Horowitz, Ethnic Groups in Conflict (Berkeley and Los Angeles: University of California Press, 1985). See also Donald L. Horowitz, “Comparing Democratic Systems,” Journal of Democracy, 1, 4 (Fall 1990): 73-79; Donald L. Horowitz, Donald L. “Democracy in Divided Societies,” Journal of Democracy, 4, 4 (Fall 1993): 18-38; and Donald L. Horowitz, “Making Moderation Pay,” In Joseph Montville, ed. Conflict and Peacemaking in Multiethnic Societies (Lexington, Mass. : Lexington Books, 1990). David Sisk, “Power Sharing in Multiethnic Societies: Principal Approaches and Practices,” in Gail W. Lapidus and Svetlana Tsalik, eds., Preventing Deadly Conflict: Strategies and Institutions, Proceedings of a Conference in Moscow, Russian Federation, August, 14-16, 1996 (New York: Carnegie Corporation, April 1998), pp. 34-67. Wolfgang Danspeckgruber, “Self-Governance Plus Regional Integration: A Solution to Self-Determination or Secession Claims in the Emerging International System,” paper presented to the 2002 Annual Convention of the American Political Science Association, Boston, MA; http://www.princeton.edu/~lisd. Hechter, Containing Nationalism, pp. 145-49. William F. Riker, “Federalism,” in Fred I. Greenstein and Nelson W. Polsby, eds., Handbook of Political Science, Vol. 5: Governmental Institutions and Processes (Reading, Mass. : Addison-Wesley, 1975), p. 101. Similar definitions may be found in K.C. Wheare, Federal Government, Fourth Edition (London, Oxford University Press, 1963, p. 11 and Robert A. Dahl, Democracy, Liberty, and Equality (Oslo: Norwegian University Press, 1986), p. 114. V.G. Vvedenskii And A.Yu. Gorokhov, Rossia: ispytanie federalizmom – Teoriya i praktika otechestvennogo i zarubezhnogo opyta (Moscow: Serebrennye niti, 2002), p. 76. Hechter, Containing Nationalism, pp. 27-55. Michael Keating, Plurinational Democracy: Stateless Nations in a Post-Sovereignty Era (Oxford: Oxford University Press, 2001. Lijphart, Democracies, pp. 23, 28-9, and 183-85. Radio Free Europe/Radio Liberty, Vol. 7, No. 93, 19 May 2003. Arend Lijphart, Democracy in Plural Societies (New Haven: Yale University Press, 1977), p. 41. Lijphart, Democracies, p. 185 quoting from Sidney Verba, “Some Dilemmas in Comparative Research,” World Politics, Vol. 20, No. 1 (October 1967), p. 126. On the distinction between the typically more radical “value rationality” and the more calculating “instrumental rationality,” see Ashutosh Varshney, “Nationalism, Ethnic Conflict, and Rationality,” Perspectives, Vol. 1, No. 1 (March 2003), pp. 85-99. Some of these are noted in Danspeckgruber, “Self-Governance Plus Regional Integration,” p. 5. See Keating, Plurinational Democracy, Chs. 3 and 5. Here I subsume under “proportionality in political representation” three of the actual eight components Lijphart noted: multi-party system, multi-dimensional party system, and proportional representation in civil service appointments. For Lijphart, these all serve the end of proportional representation of national minorities in parliament as a result of multi-party elections to parliament. Lijphart, Democracies, pp. 26-8. Some federations or federation-like systems do not have region- or community-representing upper chambers, for example, the evolving United Kingdom and Canada. The upper chambers of Spain and Russia fail to give adequate representation to national autonomies. Since their senators do not compose anything close to a majority, their senators must ally with senators not from the ethnic minorities in order to pass their preferred legislation or block undesired bills. Lijphart added to the four key elements of India’s consociational model of democracy to his original elements of consensual democracies. In the latter, cultural autonomy is grouped along with federalism as an element of the model referred to as “territorial and non-territorial federalism,” “executive power-sharing” is considered part of “grand coalition” governments, and a “written constitution” is designated as the basis through which a minority veto should be secured. Arend Lijphart, “The Puzzle of Indian Democracy,” 258-268; Lijphart, Democracies, pp. 23-30. Under Gorbachev USSR also moved belatedly in the direction of consensual democracies not so far from the Swiss and Belgian models closest to the consensual ‘ideal-type’: the separation of powers, formal and informal; balanced bicameralism and minority representation; a multiparty system; and a multidimensional party system. Lijphart, Democracies, pp. 23-30. On these aspects of the late Gorbachev era see Gordon M. Hahn, Russia’s Revolution From Above: Reform, Transition, and Revolution in the Fall of the Soviet Communist Regime, 1985-2000 (Rutgers University: Transaction Publishers, 2002), pp. 381-86. See Hahn, Russia’s Revolution From Above, Chapter 10. Horowitz, Ethnic Groups in Conflict, pp. 137-45; Donald L. Horowitz, A Democratic South Africa? Constitutional Engineering in a Divided Society (Berkeley, Calif.: University of California Press, 1991); p. 154; Paul R. Brass, Etnicity and Nationalism (New Dehli: Sage, 1991), p.245; Steven L. Burg, “Political Structures,” in Dennison Rusinow, ed., Yugoslavia: A Fractured Federalism (Washington, DC: The Wilson Center Press, 1988); and George Tsebelis, Nested Games: Rational Choice in Comparative Politics (Berkeley, Cal. : University of California Press, 1990). Horowitz, Ethnic Groups in Conflict, p. 632. Horowitz, Ethnic Groups in Conflict and Donald L. Horowitz, A Democratic South Africa? Constitutional Engineering in a Divided Society (Berekely, Calif.: University of California Press, 1991). Horowitz, A Democratic South Africa? ; Sisk cites Lijphart from his interview with him in Sisk, “Power Sharing in Multiethnic Societies,” p. 64, fn 28; Hechter, Containing Nationalism, p. 138. On Papua New Guinea’s successes with alternative voting see Ben Reilly, “The Alternative Vote and Ethnic Accommodation: New Evidence from Papua New Guinea,” Electoral Studies, 16, 1 (Spring 1997), pp. 1-11. Hechter, Containing Nationalism, p. 139. Sisk, “Power Sharing in Multiethnic Societies,” p. 59. Sisk, “Power Sharing in Multiethnic Societies,” p. 60. Haas examined the liberal model in France, Great Britain, Japan, and the United States. See Eernst Haas, Nationalism, Liberalism, and Progress: The Rise and Decline of Nationalism (Ithaca, N.Y.: Cornell University Press, 1997). Keating, Plurinational Democracy, p. 106. Stephen Krasner, Problematic Sovereignty: Contested Rules and Political Possibilities (New York: Columbia University Press, 2000). See Keating, Plurinational Democracy, Chs. 3 and 5; Danspeckgruber, “Self-Governance Plus Regional Integration;” and Wolfgang Danspeckgruber, “Self-Determination and Regionalization in Contemporary Europe,” in Wolfgang Danspeckgruber, ed., The Self-Determination of Peoples: Community, Nation, and State in an Interdependent World (Boulder, Colo.: Lynne Rienner Publishers, 2002), pp. 165-99. Ted Robert Gurr, Peoples Versus States: Minorities at Risk in the New Century (Washington, D.C.: United Institute of Peace, 2000), Chapter 2. For almost a decade a draft international Convention on Self-Determination through Self-Administration proposed by the prince of Lichtenstein that would create an international regime and court for settling state-communal disputes over issues of internal self-determination has been circulating the halls of the UN. See the draft in Danspeckgruber, The Self-Determination of Peoples, pp 382-92. Keating, Plurinational Democracy, pp. 119-123. Even the United States’s federal system has elements of asymmetry in its varied confederation-like relations with Puerto Rico, the Northern Marianas Islands, the Marshall Islands, the Republic of Palau, and the Federated States of Micronesia. On this and the prevalence of asymmetry in communally complex states see Kahn, Federalism, Democratization, and the Rule of Law in Russia, pp.62-3 and Alfred Stepan, “Russian Federalism in Comparative Perspective,” Post-Soviet Affairs, Vol. 16, No. 2, Spring 2000, pp. 133-76. On asymmetry in Belgium, Canada, Spain, and the UK see Keating, Plurinational Democracy, Ch. 4. Keating, Plurinational Democracy, pp. 103-33. This terminology is an elaboration of Keating’s view that we need to recognize “plurinationality” or “the existence of nations within nations,” which were once called nationalities. Keating, Plurinational Democracy, p. 103. See Kahn, Federalism, Democratization, and the Rule of Law in Russia, p. 47. I have used the term “official asymmetry” to refer to the arrangements established between the federal Center and individual regions on the basis of bilateral power-sharing treaties and agreements. See Gordon M. Hahn, “Putin’s Federal Reforms: Integrating Russia’s Legal Space or Destabilizing Russian Federalism?,” Demokratizatsiya, Vol. 9, No. 4 (Fall 2001), pp. 498-530 and Gordon M. Hahn, “Putin’s ‘Federal Revolution’: Administrative Versus Judicial Methods of Federal Reform”, East European Constitutional Review, Vol. 10, No. 1 (Winter 2001), pp 60-67. On nullification theory, see Kahn, Federalism, Democratization, and the Rule of Law in Russia, pp. 36-40. See Hahn, “Putin’s Federal Reforms: Integrating Russia’s Legal Space or Destabilizing Russian Federalism?”; Hahn, “Putin’s ‘Federal Revolution’”; and Gordon M. Hahn, “Putin’s Federative Reforms and Democratization,” Post-Soviet Affairs, Vol. 19, No. 2 (Spring 2003). Keating seems to assume that representation in enough and will automatically translate into decisionmaking power, consensual or otherwise. Keating, Plurinational Democracy, pp. 119-123. See Gordon M. Hahn, “The Impact of Putin’s Federative Reforms on Democratization in Russia,” Post-Soviet Affairs, Volume 19, Number 2 (April-June 2003), pp. 114-53, http://www.tandfonline.com/doi/abs/10.2747/1060-586X.19.2.114#.VNKFxZ3F-uw; Gordon M. Hahn, “The Past, Present, and Future of the Russian Federal State,” Demokratizatsiya, Volume 11, Number 3 (Summer 2003): pp. 343-62, https://www.gwu.edu/~ieresgwu/assets/docs/demokratizatsiya%20archive/11-3_Hahn.PDF; and Gordon M. Hahn, “Russian Federalism under Putin,” in Stephen White, Zvi Gitelman, and Richard Sakwa, eds., Current Developments in Russian Politics – Vol. 6 (Durham, NC: Duke University Press, 2005), pp. 148-67. See Gordon M. Hahn, Russia’s Islamic Threat (New Haven and London: Yale University Press, 2007) and Gordon M. Hahn, The Caucasus Emirate Mujahedin: Global Jihadism in Russia’s North Caucasus and Beyond (Jefferson, N.C.: McFarland Publishers, 2014). About the Author – Gordon M. Hahn, Ph.D., is an analyst and Advisory Board member at Geostrategic Forecasting Corporation (Chicago, Ill.), http://www.geostrategicforecasting.com; member of the Executive Advisory Board at the American Institute of Geostrategy (AIGEO) (Los Angeles, Calif.), http://www.aigeo.org; a contributing expert for Russia Direct, russia-direct.org; a senior researcher at the Center for Terrorism and Intelligence Studies (CETIS), Akribis Group (San Jose, Calif.); and an analyst and consultant for Russia – Other Points of View (San Mateo, California), www.russiaotherpointsofview.com. Dr. Hahn is the author of the forthcoming book from McFarland Publishers Ukraine Over the Edge: Russia, the West, and the “New Cold War”. Previously, he has authored three well-received books: The Caucasus Emirate Mujahedin: Global Jihadism in Russia’s North Caucasus and Beyond (McFarland Publishers, 2014), Russia’s Islamic Threat (Yale University Press, 2007), and Russia’s Revolution From Above: Reform, Transition and Revolution in the Fall of the Soviet Communist Regime, 1985-2000 (Transaction Publishers, 2002). He also has published numerous think tank reports, academic articles, analyses, and commentaries in both English and Russian language media.